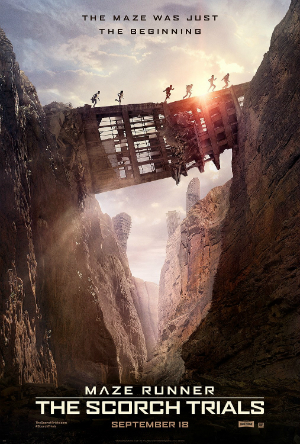 As the title suggests, there is a lot of running in Maze Runner: The Scorch Trials, the second installment in a trilogy. Even more so than its predecessor, last year’s The Maze Runner, the sequel is obsessed with constant movement of all types, although the titular “maze” is quite different in appearance. Dylan O’Brien returns as Thomas, who has now recovered more of his memories that were absent when the first installment began. Also returning are the other survivors: Newt (Thomas Brodie-Sangster), Minho (Ki Hong Lee), and Teresa (Kaya Scodelario). The new film picks up where the last one left off, with the survivors of the first trials getting picked up in a desert region by a military crew and moved to a stronghold, where they are debriefed by Janson (Aidan Gillen). Teresa is secreted away, which immediately raises Thomas’ suspicions about the facility where they are being held. Soon enough, on the basis of further suspicious activity by Janson and his men, Thomas leads a breakout, grabbing Teresa and heading into the great unknown. From there, it’s a long journey across the desert to a mountainous refuge, allowing for several enliving sequences of combat, further confinement, and escape. The episodic nature of the journey allows for guest stars to appear for individual segments, and when the so-called guests are performers of the quality of Giancarlo Esposito, Alan Tudyk, Lili Taylor, and Barry Pepper, that’s quite alright. They provide needed balance to the youthful energy of the leads, who are quite good at running, shouting, and pouting, but are not terribly capable of displaying a great variety of emotions. The greatest strength of Maze Runner: The Scorch Trials is its pace, which moves so rapidly that it covers over various plot holes that appear throughout. Wes Ball made his feature directorial debut with The Maze Runner; he’s a veteran visual artist and effects specialist, and he certainly has a flair for showcasing a striking series of varied backgrounds for the action that takes place. The bigger obstacle that the series has yet its overcome is its rote familarity. I’m not acquainted with the source novels by James Dashner, but the dystopian premise and young-adult targeting in its characterizations already feel exhausted on the big screen by the likes of multiple Hunger Games movies, not to mention Divergent, The Giver, and so forth. The Maze Runner movies have offered nothing new, thematically or character-wise, but at least The Scorch Trials offers the distraction of its quick-moving and extended action sequences. The film opens wide in theaters throughout the area on Friday, September 18.